Google I/O has been jam packed full of new, and exciting Google software and technology. While the headline acts are no doubt the arrival of the Nexus 7 and Jelly Bean, there has been some pretty interesting stuff going on in the developer sessions. One such session, dedicated to Google Wallet, unveiled a new feature, called Save to Wallet. Initially for offers and payment cards, it is seen as the first step in opening up Google Wallet to a wider audience. So, what's it all about. Taking offers first, the Save to Wallet API will allow consumers to save offers from a stores website, directly to their Google Wallet. Wallet will then remind you to take advantage of it before the coupon expires. The offers can then be applied in the store, either by showing the offer code in your Wallet, or by using the NFC capabilities on your smartphone. Pretty slick. The Save to Wallet API also applies to payment cards as well. It works pretty similarly to offers, and allows payment card providers the ability to provide the same button on their website, and offer a seamless way to enter your card into your Google Wallet. Naturally, since we're dealing with potentially sensitive data here, the API isn't just opened up to anyone who wants it. It will be opened up to a limited number of users initially, in a closed beta. Anyone interested can register, but Google will only be releasing the API to approved partners. This applies to offers, as well as payment cards. And, what about the future? As the slide here shows, Google are promising more, coming soon. It's a smart move, if they can make a go of it. Apple's Passbook is likely the beginnings of their own Wallet solution, and Windows Phone 8 has theirs on the way. 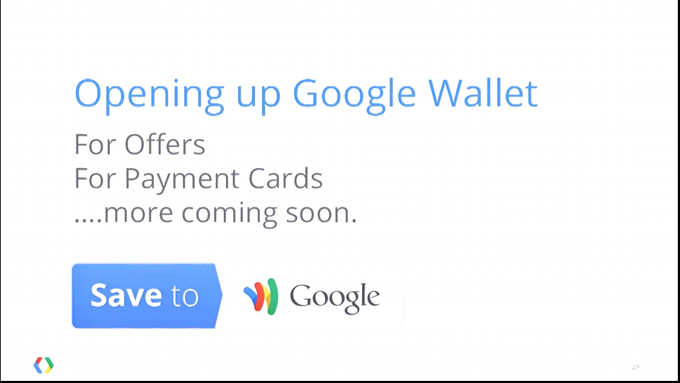 Google's taking a good first step here into expanding the functionality of Wallet. What we need now, is greater adoption -- we'd like to use our phones to pay for stuff in Europe too, Google. For your viewing convenience, we've embedded the Google Wallet session after the break.